This entry was posted in iPhone Apps, iPhone Development, Jameson Quave, Programming, Swift and tagged core data, ios, mac os, programming, swift by Jameson Quave. Bookmark the permalink. That depends on a variety of factors, like where the error is coming from. But most likely you did not check off the box “Use Core Data”. thank you for your great help. would you please provide the source code for this chapter? Even though I checked the box to use CoreData I still had to write “import CoreData” in my ViewController.swift. (I created another project to double check that I didn’t delete it on accident, and yup, same thing, it’s missing from the viewcontroller.) I’m on xCode 6.3.1. So, if you’re seeing an error like “Use of unresolved identifier ‘NSFetchRequest'”, try adding “import CoreData at the top of your ViewController.swift file. The simple solution is to delete the app from the simulator, and reinstall it. presentFirstItem() Where is this method being called from? It’s just that there is a little misprint in the tuto: the method is named “presentItemInfo” but it’s “presentFirstItem” which is called in the ViewDidLoad. Thanks again. Longing for your book. getting error below when I run example. AppDelegate.swift. Any suggestions? ignore my previous post about the BAD_EXC_ACCESS. I think I followed the tutorial steps precisely but keep getting this error: “The model used to open the store is incompatible with the one used to create the store.” Any suggestions why are welcome. This is explained in a later tutorial, but you can resolve the issue by deleting the app from the simulator and re-building. It happens when you run the app with one model, then run it again with changes to that model. First up – great stuff Jameson. These tutorials are really helpful – thank you. Second – if anyone else is getting an error saying something like ‘Warning: Attempt to present on whose view is not in the window hierarchy!’ it appears there is an issue pushing a new View onto a View which hasn’t been shown to the User. Not sure if this is new to 8.1.2 or what exactly the deal is. Regardless, I was able to get this to work by creating an override function on the ‘viewDidAppear()’ method and then put the ‘presentItemInfo()’ function inside of it. With that little change I was able to get the app running w/out any problems. Thanks James! I was probably being careless with the way I was doing the presentation, I’ll update this on the next round of changes. I also got the window hierarchy error, but though James’s fix kept the error from popping up, I still don’t see anything on the screen. It was just the presentItemInfo() function that goes in the viewDidAppear(), right? Bit late but this is the first time I’ve ever been able to perhaps help someone! As a beginner it confused me but found that you only need to put the presentItemInfo() call to the function inside the override. You never stated why we need to change the name to have the prefix of our app name. Why is this step so important. I just don’t understand why we are doing this? Could you please elaborate? 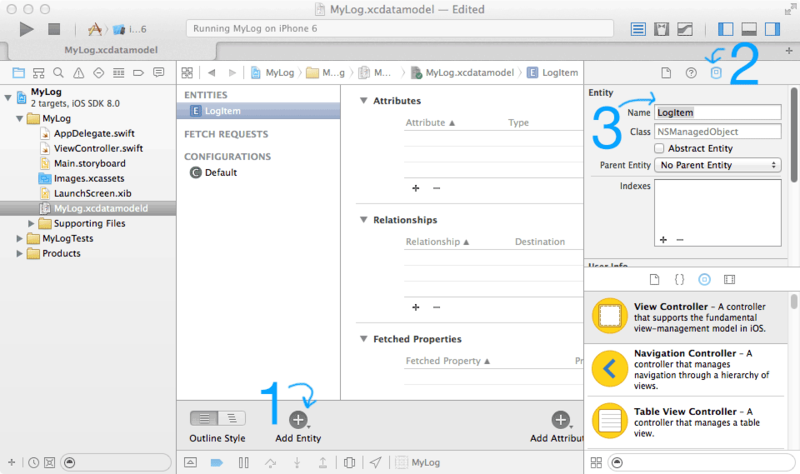 But from Core Data’s perspective, it doesn’t know about the classes inside of MyLog. “MyLog” is like another project as far as Core Data is concerned, so it gets prefixed. 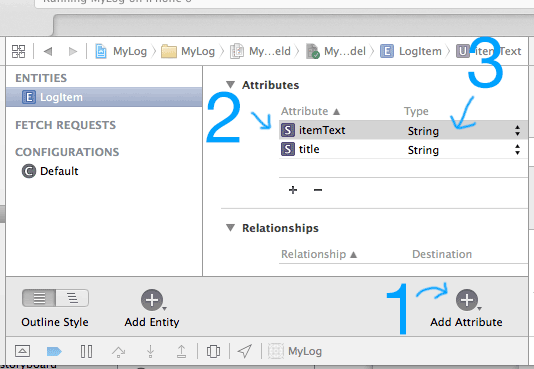 The class isn’t just “LogItem”, it’s “MyLog.LogItem” — The LogItem class inside of the MyLog project. It wants to insert a comma between as and the exclamation mark e.g.. as,! Core Data is not just a system to persist data to disk, which is what you’re describing. Core Data is an object graph that handles querying of data and complex operations such as undo graphs and a relationship manager. Having stored something in Core Data could be for those purposes, rather than the persistence functionality. So no, it is not persisted to disk at this stage yet, but it absolutely is stored in Core Data. Persisting to disk is in fact covered in the later parts. aah okay, thank you for the explanation! Hey Jameson this is some great stuff you wrote! but Xcode doesnot let me choose the langauge for the nsmanagedobject subclass it makes two files though one with .h and the other with .m extension any idea what could be wrong? i am using xcode v6.0 on vmware. Hm, this might be because of the version, try upgrading to Xcode 6.3, and if that doesn’t work you can just create the file on your own without using the generator, just copy what is shown in the github repo. Could not cast value of type ‘NSManagedObject_Settings_’ (0x7ff89ad87a00) to ‘JobManager.Settings’ (0x104f214a0). Everything seems to work well for fetching so far. Did something change in xcode since this was posted or did I mess something up? I’m not sure, but it’s possible it’s an Xcode change. I’ll review this tutorial this weekend to make sure. In the meantime if you want to put up a github repo of your code I can give it a whirl to see if I can find the issue. I had the same problem. I did a little searching and it looks like you need to prefix the class name in the xcdatamodeld before exporting the swift file. So just go back to the xcdatamodel, change the class field from LogItem to MyLog.LogItem and then from the editor menu “Create NSManagedObjectSubclass” to replace the current file. Xcode would not recognise NSEntityDescription. A quick google, and I realised that NSEntityDescription is part of the CoreData framework, and Core Data hadn’t been imported into ViewController. So, I just need to remember to add import CoreData to all my view controllers. command, I get similar errors following any number of other tutorials about core data, its driving me a little mad! That means there is an exclamation mark somewhere where it’s not necessary. Just remove the ! symbol.